Caught somewhere between paying homage to the late singer/harmonica player Gary Primich and self-igniting genuine creativity “Account to Me” is an inspiring piece music, full packed with potential to fly well beyond the usual range of clichés. The album’s tone is a unique mixture of blue eyed rock a billy and blues flowing effortlessly through a set of neatly executed numbers. Five of them are Primich covers, of which the ferocious harp blowing jewel “Put the Hammer Down” and the slowly purring jazz of “Pray for a Clowdy Day” spark maximum excitement. Mowery too came up with decent ideas of his own. His originals are easily as deserving of your attention as previously mentioned compositions. 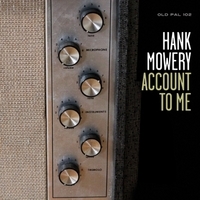 Where other bluesmen wheeze and rattle through those prescribed 12-bars, Mowery throws in a little bit of everything from jazz to soul, even kicking out some serious barroom licks as on the rascally album opener “Spend a Little Time”. On a deeper level, “If I Knew What I Know” speaks of emotional turmoil brewing underneath sharply amplified harp work and vocals. With “My Home”, another Primich cover, Mowery captures some truly warm and enticingly subtitle emotive vibes, and the man’s marvellous take on Rev. Robert Wilkins’ “That’s No Way to get Along” comes with obvious gusto and shameless sense of fun that makes the piece hard to resist. Although the material alone stands strong, Hank Mowery provides underlying elegance and beauty to these tunes, making them state of the art.